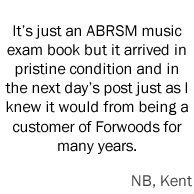 This web site is owned and operated by Forwoods Music Ltd, trading as Forwoods ScoreStore. We are completely dedicated to your total satisfaction. If you have any suggestions or comments or if you need to contact us, please email us using the link on the store page or use the details below. These terms and conditions apply to all sales via www.scorestore.co.uk. Placing an order by any means shall be treated as an offer by you to purchase the goods in accordance with these terms and conditions. We will be deemed to have accepted this order at the point at which your items have been despatched. We accept all major credit and debit cards and PayPal payments. Your order will not be processed until your payment has been authorised by your provider. All prices are in pounds sterling. The total price payable including goods, delivery and VAT (if appropriate) will be as indicated when you confirm your order. Please note that the receipts processed automatically by Forwoods ScoreStore are not VAT receipts, if you require a VAT receipt please contact us. In case of an error in the quoted price, we will advise you of the corrected price and give you the option to cancel your order or accept the revised price. We accept card and PayPal payments. If you are shopping from North America or anywhere else, place your order and your card company or PayPal will convert the transaction to US Dollars or your own currency. When confirmation of your order is received, this is to indicate that we have received your order. It does not indicate that a contract exists between us. We will indicate acceptance of your order, and hence a contract between us, when we send you a despatch confirmation. We have included this term to protect us in the case that a mistake has been made in pricing, we have inadvertently under-priced goods, or we are no longer able to supply a particular product for some reason. In the case of a change of price, we will always contact you first to ensure that the price is acceptable. All products are sold subject to availability and may be withdrawn from sale at any time. If we are unable to fulfill your order, we will not charge you for any items that have not been supplied and will refund any payments already made for these items. We will not be liable for any other losses you incur as a result of our not meeting your order.